Interleukin (IL)-18 cascade-mediated mechanism is deeply involved in host defense against parasitic infections both in vivo and in vitro. A patient who acquired hookworm-related cutaneous larva migrans (HrCLM) in Pattaya, Thailand, was investigated for the transition of serum Th2 cytokines. A 5-year-old healthy girl had walked barefoot on a beach in Pattaya, Thailand. After returning to Japan, linear red nodules appeared on her foot plantar and dorsum. Although the parasite remained undetected in a surgery, she was administered oral ivermectin twice at 1-week interval. Her eosinophil count, immunoglobulin (Ig) E level, and serum immune-related Th2 cytokine levels (IL-3, IL-4, IL-5, IL-13, IL-18, and IL-33) were sequentially measured. The IL-18 cascade was found to be largely involved in HrCLM. 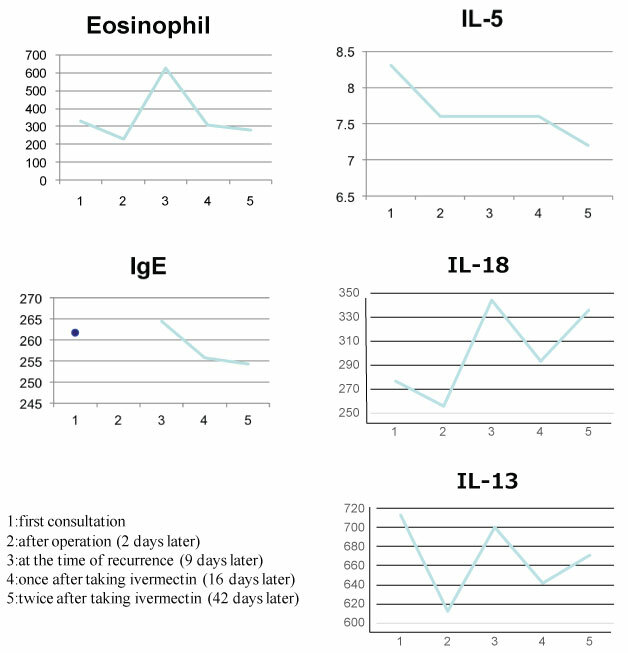 IL-18 and IL-13 exerted an anthelmintic action along with increased eosinophil counts. One of the symptoms of creeping disease in humans is the accidental occurrence of hookworm-related cutaneous larva migrans (HrCLM). It usually occurs following contact with soil, sand, and mud found on beaches in tropical countries. Skin eruptions, such as linear nodules, appear on the foot and lower extremities. Misdiagnosis and inefficient treatment for travelers have often been reported [1-3]. Although the parasite species remained unidentified in our case, the characteristic skin eruption in combination with travel history to an endemic region helped to establish the diagnosis. The underlying mechanism for the appearance of Th2 cytokines in HrCLM remains unclear. Here, we described a case of transition of plasma Th2 cytokines in a patient with HrCLM who acquired the infection in Pattaya, Thailand. A 5-year-old healthy girl presented to our department with the complaint of moving subcutaneous linear red nodules on the plantar and dorsum of her foot (Figure 1A). She had visited Pattaya, Thailand, with her family 21 days ago and had walked barefoot on a beach. She did not exhibit any other symptoms, such as fever, abdominal pain, or respiratory abnormalities. Based on the information regarding the visit to Thailand and limited foot linear nodules, several parasites, including Ancylostoma ceylanicum, A. caninum, A. braziliense, A. duodenale, Uncinaria stenocephala, and Necator americanus, were suspected. Initially, the diagnosis was unclear; therefore, we obtained informed consent from her parents before surgery. Two days after her first visit to our department, the five suspected skin lesions were excised under general anesthesia. However, the moving nodules reappeared 9 days postoperatively (Figure 1B). Although we observed spongiosis with band-like eosinophil and neutrophil infiltration in the dermis, no parasite was identified from any of the excised specimens (Figure 2). She was orally administered ivermectin (3 mg) twice with at 1-week interval. Thereafter, the eruption did not reappear. We performed antibody screening using an antiparasite test (SRL Inc., Tokyo, Japan). Liver fluke and Cysticercus cellulosae showed false positive results; however, immunoglobulin G (IgG) antibody titer did not elevate in the recovery stage compared to that in the acute stage. Anti-IgG-specific antibodies were negative for Dirofilaria immitis, Toxocara canis, Ascaris suum, Anisakis, Gnathostoma, Strongyloides stercoralis, Paragonimus westermani, P. miyazaki, Fasciola hepatica, and Spirometra erinaceieuropaei at all stages. Based on these results, we suspected that the patient had acquired HrCLM because many cases of creeping disease caused due to hookworms have been reported in Thailand . We discussed regarding the type of parasite that may have caused HrCLM and transition of Th2 cytokines in the current case. DNA was extracted from paraffin-embedded tissue at resection, and polymerase chain reaction (PCR) was performed using specific primers for A. ceylanium [4-6], A. caninum [4-6], A. Brasiliense [6,7], A. duodenale , U. stenocephala , and N. americanus ; however, no amplification was detected. For further investigation, the eosinophil count, IgE level, and serum immune-related Th2 cytokine levels (IL-3, IL-4, IL-5, IL-13, IL-18, and IL-33) were measured at the first visit, after 2 days postoperatively, at the time of recurrence (after 9 days), after the first dose of ivermectin (after 16 days), and after the second dose of ivermectin (after 42 days). The results of cytokine concentration are shown in (Figure 3). IL-3, IL-4, and IL-33 levels were below the detection limit. IL-13 and IL-18 levels were decreased postoperatively, elevated at recurrence, and decreased again after ivermectin administration. IL-5 levels gradually decreased. IL-18 cascade-mediated mechanism is involved in host defense against parasitic infections, including that caused by Strongyloides venezuelensis [8,9]. IL-13, a Th2 cytokine, induces IgE and eosinophil production during parasitic infections. IL-18 and IL-13 levels were slightly decreased postoperatively but increased during the recurrence stage. The transition of IL-18 and IL-13 levels revealed the active movement of hookworm and host defense against the parasite. IL-13 and IL-18 production would be more enhanced after second time taking ivermectin. This was probably due to killing whole parasites, resulting in the increase of further inflammation. Eosinophil counts, IL-5, and IgE levels correlated well with the treatment procedure. IL-5 levels reportedly decreased following ivermectin administration . IL-5 level decreased gradually but the IL-18 and IL-13 directly corresponding to the recurrence and treatment. Without the presence of specific pathogen, over production of IL-18 induces Th2 skewing, causing the hyper production of IL-4, IL-5, and IL-13. Although IL-4 and IL-13 share the same receptor subunit, IL-5 dose not. This discordance may influence the different pattern of cytokine fluctuate. Taken together, we described the transition of Th2 cytokines, which were largely involved in HrCLM, in a patient with acquired HrCLM. Furthermore, IL-18, in combination with IL-13, was associated with anthelmintic mechanism. Both authors did not receive any financial support. All the data and information supporting our conclusions are included in the manuscript. Both authors contributed to the study project and have read and approved the final manuscript. Written informed consent was obtained from the patient's parents for publication of the case report and any accompanying interests. The Institutional Review Board (IRB) of Mie University Hospital approved the investigational protocol (Permit Number 3156). Bouchaud O, Houzé S, Schiemann R, Durand R, Ralaimazava P, et al. (2000) Cutaneous larva migrans in travelers: A prospective study, with assessment of therapy with ivermectin. Clin Infect Dis 31: 493-498. 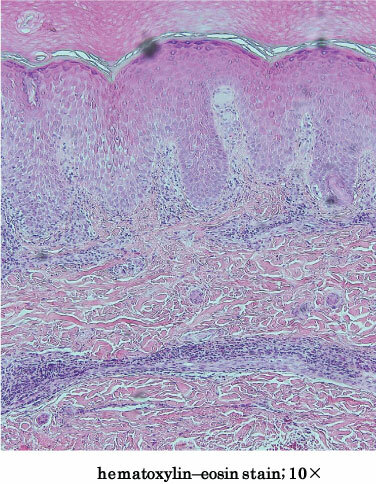 Blackwell V, Vega-Lopez F (2001) Cutaneous larva migrans: Clinical features and management of 44 cases presenting in the returning traveller. Br J Dermatol 145: 434-437. Sivasubramanian G (2012) Creeping eruption in a returning traveler. Am J Med Sci 343: 162. Phosuk I, Intapan PM, Thanchomnang T, Sanpool O, Janwan P, et al. (2013) Molecular detection of ancylostoma duodenale, ancylostoma ceylanicum, and necator americanus in humans in northeastern and southern thailand. Korean J Parasitol 51: 747-749. Hu W, Wu S, Yu X, Abullahi AY, Song M, et al. (2015) A multiplex PCR for simultaneous detection of three zoonotic parasites Ancylostoma ceylanicum, A. caninum, and Giardia lamblia assemblage A. Biomed Res Int. Le Joncour A, Lacour SA, Lecso G, Regnier S, Guillot J, et al. (2012) Molecular characterization of ancylostoma braziliense larvae in a patient with hookworm-related cutaneous larva migrans. Am J Trop Med Hyg 86: 843-845. Liu YJ, Zheng GC, Zhang P, Alsarakibi M, Zhang XH, et al. (2015) Molecular identification of hookworms in stray and shelter dogs from Guangzhou city, China using ITS sequences. J Helminthol 89: 196-202. Yasuda K, Muto T, Kawagoe T, Matsumoto M, Sasaki Y, et al. (2012) Contribution of IL-33-activated type II innate lymphoid cells to pulmonary eosinophilia in intestinal nematode-infected mice. Proc Natl Acad Sci U S A 109: 3451-3456. Sasaki Y, Yoshimoto T, Maruyama H, Tegoshi T, Ohta N, et al. (2005) IL-18 with IL-2 protects against Strongyloides venezuelensis infection by activating mucosal mast cell-dependent type 2 innate immunity. J Exp Med 202: 607-616. Shimogawara R, Hata N, Schuster A, Lesshafft H, Guedes de Oliveira S, et al. (2013) Hookworm-related cutaneous larva migrans in patients living in an endemic community in Brazil: Immunological patterns before and after ivermectin treatmen. Eur J Microbiol Immunol 3: 258-266. 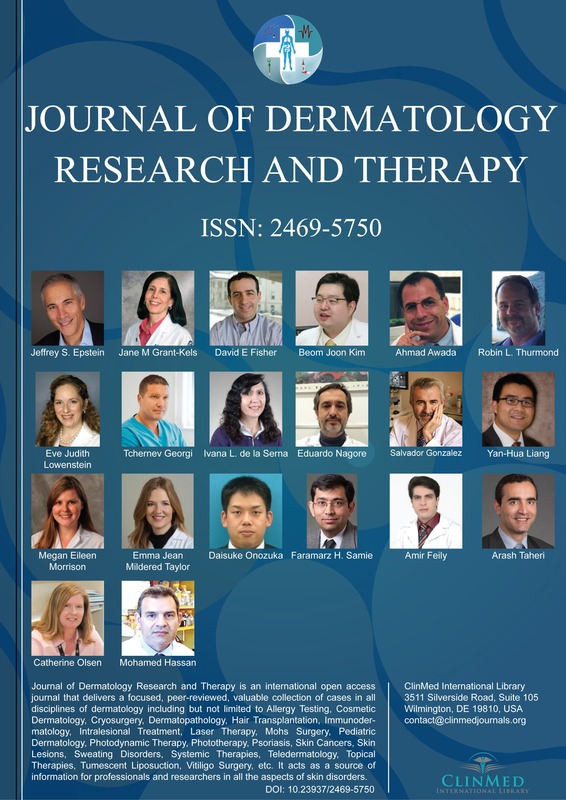 Keiichi Yamanaka, MD, PhD, Department of Dermatology, Graduate School of Medicine, Mie University, 2-174 Edobashi, Tsu, Mie 514-8507, Japan, Tel: +81-59-231-5025, Fax: +81-59-231-5206, ORCID ID: 0000-0003-3055-5202. © 2019 Kondo M, et al. This is an open-access article distributed under the terms of the Creative Commons Attribution License, which permits unrestricted use, distribution, and reproduction in any medium, provided the original author and source are credited.